Frankly writing, there are many thing what I want to do. In other words, spending a lot of time for multiple things and don’t make them be mature. Always, I recognize this is not good for me because “If you run after two hares, you will catch neither” and time is limited. So need to select and concentrate one or two thing what I do after business time. At same time, I’m aware of that I can something in business time. But I have not yet found good reason to make priorities for those. To find the priority is first thing in this year. At new year’s day, every year, I looked back past year by comparing original target and set new target, I have been doing for several years. Last Year’s Target is here. No1’s target was to launch Mobile App. Unfortunately I couldn’t archive this. Then I considered why couldn’t this might be related with No2. Actually I have been practicing violin for one year. It means I fully spent remaining time after work for practicing violin due to limited time. Second target was successfully archived, as i mentioned, playing violin and enjoying classic music were new for me, then I felt my view of the world was extended. And from last July, My life has been totally changed because I moved to Singapore due to assignment in work. This also was new for me and make me enjoy work again. It must be valuable experience for me. Let me move to This year’s target. – No.1: Improving English Speak Ability by enhancing vocabulary. I’m getting used to use English itself during working time and daily life. But sometime i feel my expression is very poor because my vocabulary and idiom is so limited. I’m not sure how i can improve this at this moment. But I’d like to try this. Stamina is getting more weaker as being older. But since life style was dramatically changed, I need to be more tough. Maybe there will be some round-trip flight between JP and SG since my family remains in Japan. Then I can’t avoid to use red eye flight to make efficient time usage. So have to start making some exercise. I hope you will have a nice year 2017! Last weekend, I visited to Hong Kong as private trip. This was first time to be there. I was surprised that the city was very narrow between Harbor and mountain. There are so many slope and standing high building on that. Dim Sum, congee with Fried bread, adn Wontan Noodle were good test. But better to trip with some one because Chinese Food serves with big plate for many person. Single Traveller can’t fully enjoy food. Only one and half days, but I believe I could be at all place where traveller must to go. I’m wondering why i always posted what i bought… but today also i’m writing about new product. By getting used to Singapore Life, looking for good food or cafe place near house. But to find more new shop, I wanted to expand area. Singapore’s public transport is very organized. Bus network is fully developed across the country. People can freely go to anywhere without car. But there are some place can’t directly go. So better to have Personal Mobility Devices(PMS) like Segeway or eScooter. LTA(Land Transport Authority) has official rule for PMDs. So in Singapore, person can have PMDs. I just brought most reasonable eScooter. Max Speed is 25km/h same as LTA’s rule. and available distance by battery is almost 20km. It’s enough to run around my home. 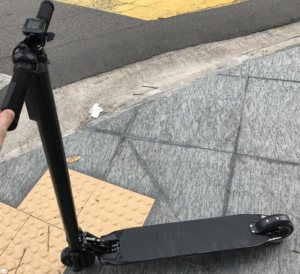 Today, I just tried to confirm battery limitation and comfortable to ride. In the city, i faced some difficulty to smoothly run and out of city is very fun. But one issue is that acceleration power was dropped during low battery. Anyway I’m satisfied with entire performance with this price. I was looking for coffee kettle to make drip coffee at home. Actually my renting house has built in coffee maker. But it’s not easy to maintain to be clean. Last one month, i walked around to find my preference kettle in Singapore, since I don’t have enough shop list for those, couldn’t find out it, brought this kettle in japan , not only for coffee or other boiled water to any use. This kettle’s capacity is 0.9L at once. It’s not big and not small for me. I like this.